The Royal Game of Ur, also known as the Game of Twenty Squares, refers to an ancient game represented by two gameboards found in the Royal Tombs of Ur in Iraq by Sir Leonard Woolley in the 1920s. The two boards date from the First Dynasty of Ur, before 2600 BC, thus making the Royal Game of Ur one of the oldest examples of board gaming equipment found, although Senet boards found in Egyptian graves predate it as much as 900 years. 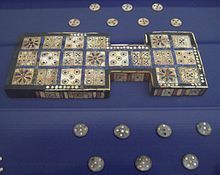 The Ur-style Twenty Squares gameboard was also known in Egypt as Asseb, and has been found in Pharaoh Tutankhamen's tomb, among other places. Discovery of a tablet partially describing the gameplay has allowed the game to be played again after over 2000 years, although reconstructions of the detailed rules have differed widely. One of the two boards from Ur is exhibited in the collections of the British Museum in London. The Royal Game of Ur was played with two sets, one black and one white, of seven markers and three tetrahedral dice. After around 1000 BC, the layout of the twenty squares was altered to make the end course for the markers a straight line. 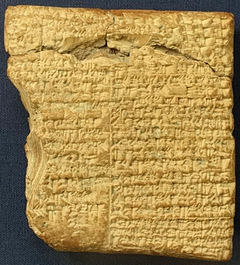 The rules of the game as it was played in Mesopotamia are not completely known but there have been a number of reconstructions of gameplay, based on a cuneiform tablet of Babylonian origin dating from 177-176 BC by the scribe Itti-Marduk-Balāṭu. It is universally agreed that the Royal Game of Ur, like Senet, is a race game. Both games may be predecessors to the present-day backgammon. A graffito version of the game was discovered on one of the human-headed winged bull gate sentinels from the palace of Sargon II (721-705 BC) in the city of Khorsabad, now in the British Museum in London (see illustration). Similar games have since been discovered on other sculptures in other museums. Modern game companies have sold game sets featuring reproductions of the original game board, along with rules derived from the tablet. Among them are Ur: Royal Game of Sumer, from Selchow & Righter in association with the British Museum. The television series Lost references the discovery of the game when John Locke explains the origins of backgammon to Walt in the episode "Pilot, Part 2." In the film Screamers some of the characters play the game for cigarettes. In the "Queen Esther & Purim" episode of The Naked Archaeologist, it is proposed as the game which Haman uses to choose the date to commit genocide against the Jews in captivity. In the MMORPG Achaea, Dreams of Divine Lands, Ur is played by the inhabitants of Istarion, under the name Nai-an'tzai-an'har. In the Action-adventure game Uncharted 3: Drake's Deception, one of the hidden treasures is the board game.